Much of luthiery involves the use of exotic hardwoods. 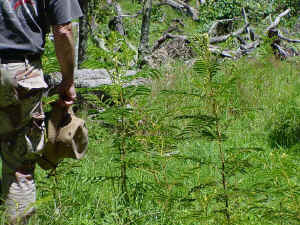 Unfortunately most luthiers do not live in the environment that their woods come from, and as such, they are unable to participate in the management of these precious resources. I am lucky enough to be close to the source of the main exotic wood that I use, Hawaiian Koa. 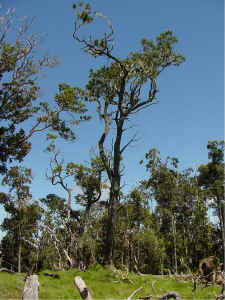 Most of the remaining reserves of Hawaiian Koa are found on the island of Hawaii, on which I live. 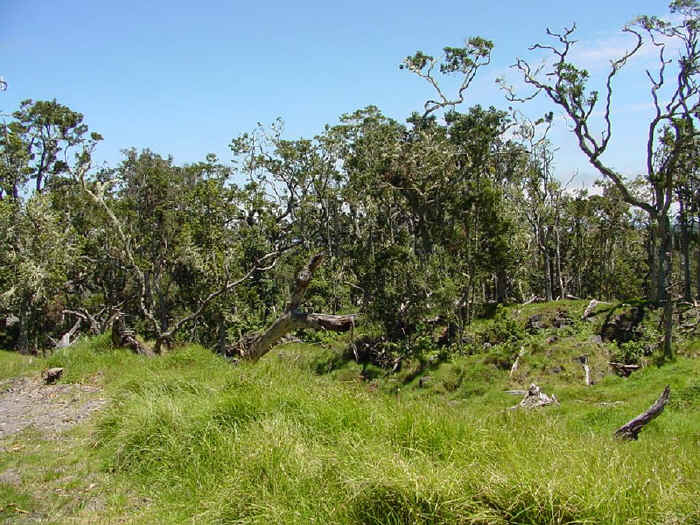 For awhile now I have been involved with several woodworkers in a project to protect a small piece of the remaining koa forest, and encourage the regeneration of new young trees on a parcel of land near the 6,000 foot level of Mauna Kea. 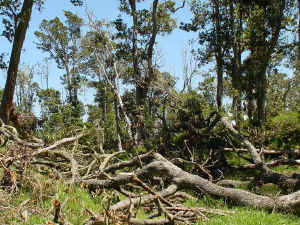 Not many landowners in Hawaii are interested in regenerating koa forests because it takes too long for them to profit financially. Like all natural resources on the Earth, it comes down to a question of money.This piece of property has been fenced to keep out cattle. 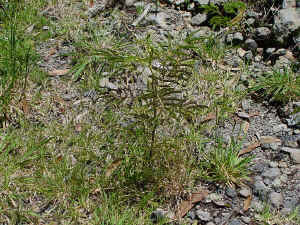 We are currently involved in an ongoing project to fertilize young trees and remove noxious weeds, such as banana poka. 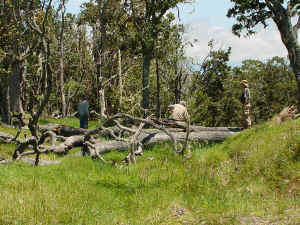 The presence of range cattle is devastating to the koa forest. 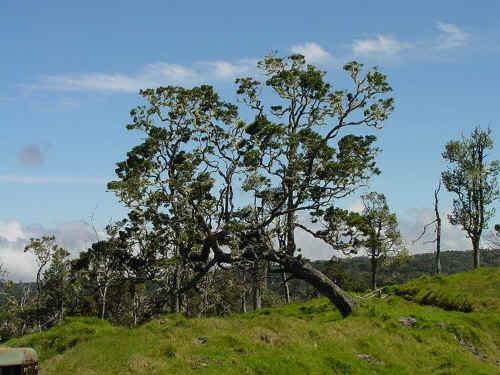 No young trees survive where the cattle roam, except in the steepest of gulches. 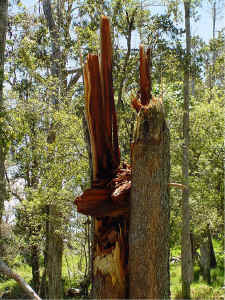 Banana poka is an aggressive vine that climbs and chokes growing trees. 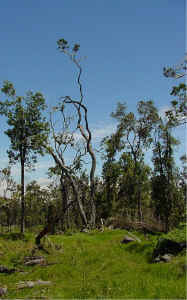 The following photos are representative of many koa forest areas. 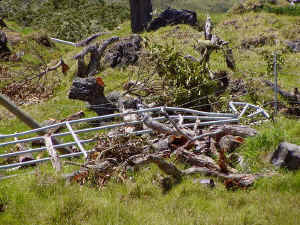 This particular trip was to repair damage to the fences from a recent storm. 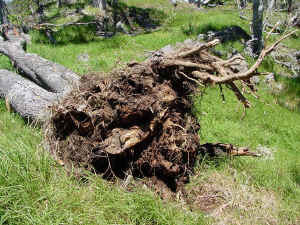 As well as damage to the fences, many mature trees were uprooted or broken. 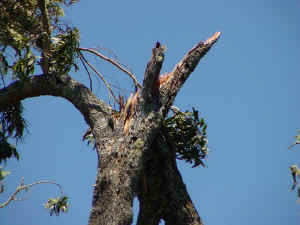 The first few photos show storm damage. Young koas sprout aggressively once the cattle are removed. These seedlings have sprouted naturally from fallen seed. In time they will need to be thinned. 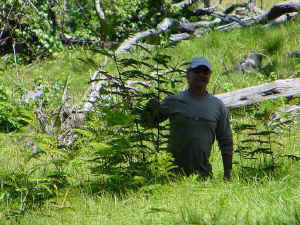 We have fertilized as many seedlings as possible and are working on weed control. While there are some straight tall trees in the forest, the majority of koa grows in tortured fashions. Lots of bent trunks and odd tree shapes. 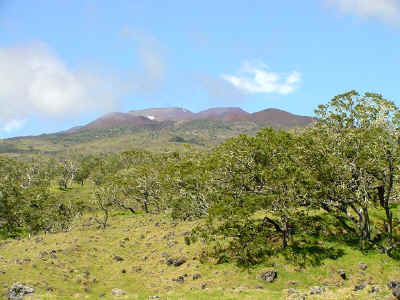 The following are typical koa forest views on this part of the mountain. 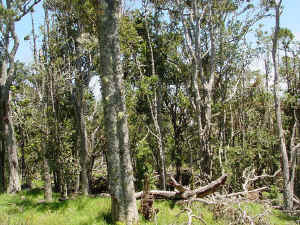 This is a mixed forest of koa, kolea, ohia, naio, and other native trees.